The industry’s new best-of-breed. Our customers told us exactly what they’re looking for in a gas monitoring solution: reliability, simplicity, ease of use. The new iSeries platform delivers on all counts - and then goes a step farther. A core product in Thermo’s new iSeries product line is the Model 43i -TLE SO2 analyzer. Using pulsed fluorescence technology, the Model 43i -TLE measures the amount of sulfur dioxide in the air down to 50 ppt. The pulsing of the U.V. source lamp serves to increase the optical intensity whereby a greater U.V. energy throughput and lower detectable SO2 concentration are realized. Reflective bandpass filters, as compared to commonly used transmission filters, are less subject to photochemical degradation and more selective in wavelength isolation. This results in both increased detection specificity and long term stability. This state-of-the-art gas analyzer offers features such as an ethernet port as well as flash memory for increased data storage. You can easily program soft-keys to allow you to jump directly to frequently accessed functions, menus or screens The larger interface screen can display up to five lines of measurement information while primary screen remains visible. 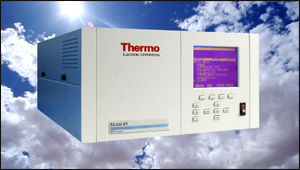 For more information visit the Model 43i TLE Enhanced Trace Level SO2 Analyzer Webpage.